The main points of this paper are that loanable-funds macroeconomic models with their “natural” interest rate do not fit with modern institutions and data. Before getting into the numbers, it makes sense to describe the models and how to think about macroeconomics in the first place. Today’s “New Keynesian” orthodoxy says that short- to medium-run performance is determined by interest-sensitive “loanable funds.” Unimpeded interest-rate adjustment should support robust macroeconomic equilibrium. Examples of this thinking include the (visibly nonexisting) “zero lower bound” on rates, which allegedly holds down saving and contributes to secular stagnation, the global “savings glut” keeping market rates near zero, and the “dynamic stochastic general equilibrium” (DSGE) models beloved by freshwater economists and central banks in which investment is determined by saving as a function of financial return. Loanable-funds doctrine dates back to the early nineteenth century and was forcefully restated by the Swedish economist Knut Wicksell around the turn of the twentieth (with implications for inflation not pursued here). It was repudiated in 1936 by John Maynard Keynes in his General Theory. Before that he was merely a leading post-Wicksellian rather than the greatest economist of his and later times. Macroeconomic models are built around assumptions about behavior imposed upon accounting relationships such as value of output (or demand) equals cost of output (which generates income), and value of assets in a balance sheet equals value of liabilities plus net worth. Keynes said that changes in income dominate in making sure that the first accounting balance is satisfied. He switched Wicksell’s assumptions about macro causality—or, in the jargon, the “closure” of the model—to fit his understanding of the system. New Keynesian economists reswitch the closure back to Wicksell. Institutions have evolved since Wicksell and Keynes were writing—the welfare state materialized and international trade expanded. Both thought, correctly for their times, that most saving comes from households and that most investment is done by business. Unlike Keynes, Wicksell argued that “the” interest rate as opposed to the level of output adjusts to ensure macro balance. If potential investment falls short of saving, then, maybe with some help from inflation and the central bank, the rate will decrease. Households will save less (and possibly also run up debt to buy into a financial bubble as prior to 2007), and firms seek to invest more. The supply of loanable funds will go down and demand up, until the two flows equalize with the interest rate at its “natural” level. In New Keynesian thinking, demand for investment can be so weak and the desire to save so strong that the natural rate lies below zero. The “distortion” imposed by the zero lower bound short-circuits the adjustment process, leading to calls for central banks to raise their inflation targets to reduce the “real” interest rate (nominal rate minus inflation). More straightforward interventions—such as restoring American labor’s bargaining power so that rising wages can push up prices from the side of costs, expansionary fiscal policy, or redistributing from the top 1 percent to households in the bottom half of the income size distribution whose saving rates are negative—are apparently impossible for “political” reasons. This is a review of this edited book that was just published in the Review of Political Economy. This substantial volume provides an interesting and exhaustive discussion of the theories of business cycles as presented in the main economic dictionaries and encyclopedias over a period of almost two centuries. For the most part the content corresponds to the views of key authors who contributed to the development of the theories of fluctuations. Some major authors are nevertheless not directly covered, presumably because they did not write, or were not the subject of, encyclopedia entries. Joseph Schumpeter is one example of an important author who is not covered. Several chapters are devoted to schools of thought, e.g. Real Business Cycles, or to subfields like Political Business Cycles. The editor’s decision to focus on dictionary entries reflects his belief that these publications were authoritative and influential, and that the views expressed in them carried significant weight. Part I, which is comprised of four chapters written by the editor, Daniele Besomi, provides an invaluable discussion of the history of economic dictionaries, and a useful analysis of the different terms economists have applied to what we now call the business cycle. The distinction between cycles proper and crises is central to the way Besomi classifies cycle theories, and again becomes relevant at the end of the volume when some alternative views are analyzed. Part II discusses the so-called classical dictionaries, and covers a vast number of contributions from the early 19th century until approximately the late 1960s, including entries on crucial authors like Wilhelm Roscher, Clément Juglar, Adolf Wagner, Mikhail Tugan-Baranovsky, Arthur Spiethoff, Wesley C. Mitchell, Arthur Burns, Trygve Haavelmo and Jan Tinbergen. Dictionaries in French, German, Italian, Russian and Spanish are represented. The chapters explain the evolution of views on fluctuations, from a general discussion of unsystematic crises, to the analysis of more regular crises dependent on the state of confidence, and from Marxist crises of underconsumption, overproduction and disproportionality, to the development in the 1930s of the shock and propagation mechanism theories, which rely on more precise formal mechanisms to explain fluctuations. The absence of some key names is unfortunate. Given the importance of the multiplier mechanism, Kalecki and Keynes deserve more attention than they get in this book. John Maurice Clark and the accelerator principle also get minor mention. More importantly, Besomi does not clearly distinguish theories that see the cycle as the result of external shocks from those that emphasize the endogenous character of economic fluctuations. There is a brief discussion on how Mitchell’s views rely in an informal way on the interaction of the multiplier and the accelerator, but no specific entry on the theories in which these two mechanisms are the key generators of fluctuations. Nor is there a full discussion of Richard Goodwin’s predator-prey model, which together with the multiplier-accelerator mechanism, provides one of the fundamental explanations of business cycles as endogenously generated phenomena. There is a brief discussion of the predator-prey mechanism in a chapter on nonlinear cycles, a field in which Goodwin formalized ideas developed by Nicholas Kaldor and John Hicks. Goodwin’s growth-cycle model was developed in the period of the classical dictionaries, but presumably was not discussed in any of them. The last part of the book covers the period of the recent dictionaries. Nikolai Kondratiev and Long Wave theories of the cycle are discussed in this part, along with Real Business Cycles, political cycles and nonlinear cycles. There is no discussion of how the mainstream, which had accepted the multiplier-accelerator framework during the period when the Neoclassical Synthesis held sway, came to adopt optimizing models with imperfections and demand shocks as the main explanation of fluctuations. All we are told is that these models arose in reaction to Real Business Cycle theory. Aside from its discussion of long waves, the book offers no explicit chapter on heterodox views of the cycle (unless one classifies all nonlinear cycle theories as heterodox—a questionable view, to say the least). This seems to be due not to the failure of recent encyclopedias to discuss heterodox theories but to the choices Besomi and his contributors made regarding which dictionaries to consider. To some extent this problem is mitigated by the thought-provoking last chapter on the return of crisis theory, also penned by the editor. Recent theories of crisis tend to emphasize the non-calculable, or qualitative, aspects of fluctuations, as against the more formal and mechanistic elements of cycle theories. In this chapter some entries that explicitly deal with Marxist and Post-Keynesian theories are discussed. The view of crises, particularly financial crises, as endemic within this context is also examined, although the work of Hyman Minsky, which is central to this topic, is not explicitly explored. There is only one brief mention of Minsky, in an early chapter by the editor on the taxonomy of fluctuation theories. Most of the concerns I have raised about the coverage in this impressive volume are related to the choice to analyze the evolution of views on crises and cycles through the lens of entries in the most prominent dictionaries and encyclopedias. This provides a relatively easy way to determine the consensus view at a particular point in time; but it also precludes a more critical understanding of the limitations of conventional wisdom. This is by no means a disqualifying feature of the volume under review; it is merely an editorial choice that privileges certain views at the expense of others—a trade-off that, at the end of the day, is unavoidable. This volume is a tour de force, and will remain an essential resource for those interested in the history of business cycle theories. This Friday for those in New York, during the Meeting of the Eastern Economic Association. 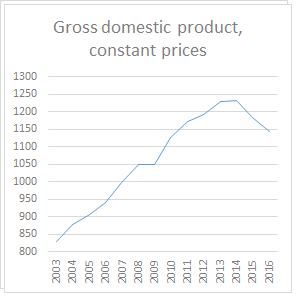 GDP has collapsed by a bit more than 7% in real terms over the last two years in Brazil (graph below show more recent data). This constitutes the worst crisis in recorded macroeconomic history, worse than the debt crisis of the early 1980s, and even the Great Depression. The reasons for this crisis are entirely self-inflicted. I discussed those issues before here (and here). The problem is not fiscal, which resulted from the crisis, nor external, since there was no real issue in financing the current account deficits. The fiscal adjustment was the main cause of the recession. And certainly monetary tightening didn't help, actually it made the fiscal situation worse by increasing debt servicing costs. At any rate, recently a short newspaper piece (in Portuguese, and registration might be required) by André Lara-Resende, one of the authors behind the idea of inertial inflation, and a student of Lance Taylor at MIT in the 1970s, has received significant praise from a wide and diverse audience. So I finally decided to read it. Lara-Resende notes, correctly, that the empirical evidence for the simple Quantity Theory of Money is not particularly good, and that there is little connection between money supply and prices. He also notes that modern macro has had a Wicksellian turn, something that is not that new. He is retooling and trying to learn modern macro at Columbia, and discovered the Fiscal Theory of the Price Level (FTPL). In the traditional QTM story, if the economy is at full employment, and if we assume that the optimal output level is rigid and does not react to demand expansion, and the central bank increases money supply, then inflation would follow. Inflation may actually follow in this scenario even if the central bank decides to tighten monetary policy and not finance the deficits, according to New Classical authors. Sargent and Wallace argue that economic agents know that lower money supply growth today would lead to faster money growth in the future. In other words, if the central bank does not monetize debt in the present, it will be forced to do so in the future, since public debt is a promise to pay in cash in the future, and tighter money now means more inflation later. This would be a situation in which fiscal policy dominates monetary policy. Fiscal dominance is a situation where the central bank gives up its control over the quantity of money and over inflation to prevent the government from defaulting on its public debt. In addition, with rational expectations, economic agents would anticipate this higher growth rate in the future, and inflation would accelerate in the present without monetization. Sargent and Wallace suggest that inflation becomes always and everywhere a fiscal phenomenon. This is the basis of the FTPL, and the work of Cochrane, which Lara-Resende sees as unorthodox and an alternative to conservatism. Note that he sees this ideas as unorthodox, in particular because they can account for the possibility of a positive relation between the nominal rate of interest and the price level, something that used to be called the Gibson Paradox. * But, like Cochrane and his fellow New Classical authors, the idea is that to control inflation you need a good old-fashioned fiscal adjustment (btw, that was true too for the old Monetarists, that thought that monetary expansion was caused by fiscal deficits). The notion that monetization of debt, or fiscal dominance, would lead to inflation, however, is predicated on the supposition that the system has a tendency to move to full employment, and to do it relatively fast. The central question regarding monetization, then, is what determines this supply constraint that imposes an inflation barrier to demand expansion, what Friedman referred to as the natural rate of unemployment – note that natural was meant to suggest that policy cannot affect it. If the economy is below the supply constraint or the supply constraint is variable, then monetization is not inflationary. Interestingly enough, Lara-Resende does not discuss whether Brazil is at the natural rate at all, and what would be the effect of a massive fiscal adjustment. The idea here is that low rates of interest would signal, lower inflation expectations, and that the fiscal adjustment would reduce the real rate of interest determined by non-monetary factors (the natural rate of interest). There are too many problems with the notion of a natural rate of interest (yes, as I always insist, go learn about the capital debates). But there is hardly anything unorthodox about it. And besides, austerity, which seems to be the default position now in Brazil, would lead to a worsening of the crisis, and contrary to what Lara-Resende thinks, monetary tightening, through its effect on the exchange rate and the cost of imported goods (and its impact on real wages; on top of the effects of the recession on workers' bargaining power, and the government's policy for minimum wages), would maintain inflation low. Low rates of interest (even if welcome) are not the solution; at this stage only expansionary fiscal policy would work. * It's not really a paradox in a classical (as in classical political economy) context, in which the interest rate is a cost of production. 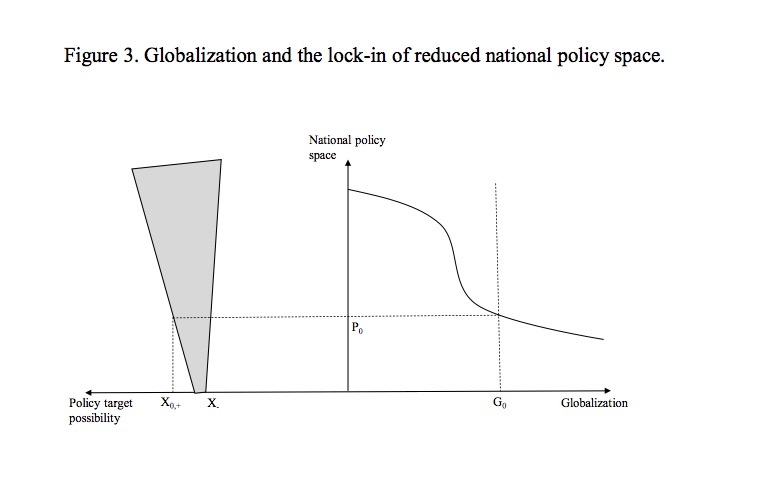 As a followed up on my recent discussion on Dani Rodrik's paper, below Tom Palley's critique of Rodrik's trilemma between globalization, national sovereignty, and democratic politics. Tom argues that there is no trilemma, only a dilemma, and that democracy is not on the same plane. From his paper "A Theory of Economic Policy Lock-in and Lock-out via Hysteresis: Rethinking Economists’ Approach to Economic Policy." Rodrik (2011) has argued that globalization poses a trilemma between globalization, national sovereignty, and democratic politics. He argues that you can have any two, but not all three. The framework in Figure 3 qualifies that interpretation. From the perspective of the nation state there is no trilemma, only a dilemma. National sovereignty can be identified with national policy space. 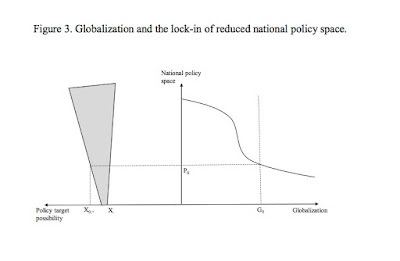 Globalization creates a trade-off between national policy space and the degree of globalization, with national policy space declining as globalization deepens. Democracy is not at issue. Countries can be outside of globalization and democratic, or they can be engaged in globalization and democratic. Democratic politics is always viable. The problem is globalization diminishes the “content” of democratic politics, as measured by the achievable range of the policy target. 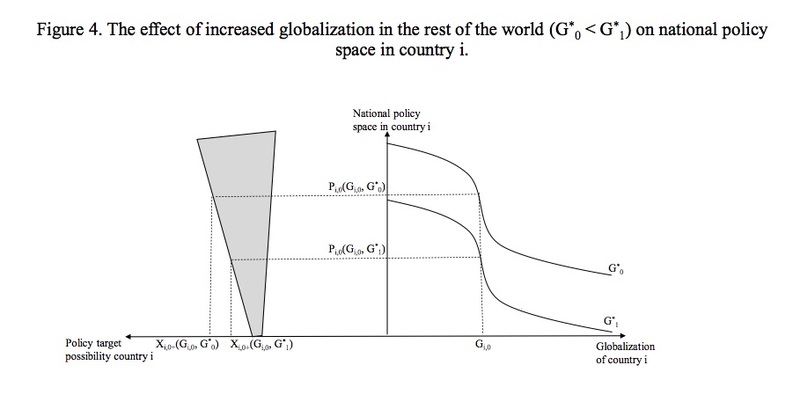 In fact, the problem is likely more complex than illustrated in Figure 3 because a country that seeks to avoid globalization may still find its policy space impacted by globalization. This is illustrated in Figure 4. 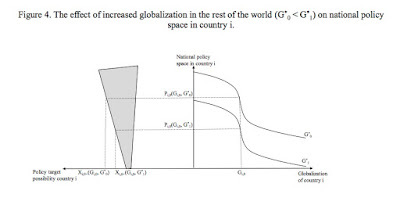 As globalization increases in the rest of the world (G*0 < G*1), policy space decreases in country i despite unchanged local engagement with globalization (Pi,0(Gi,0, G*0) > Pi,0(Gi,0, G*1)), which reduces the achievable range of the policy target (Xi,0+( Gi,0, G*0) > Xi,0+( Gi,0, G*1)). That is because globalization is relational. When other countries deepen their globalization, that imposes additional constraints on countries that do not follow suit because it negatively impacts the latter’s network of relations. The exact nature of this shift will depend on the type of globalization adopted by the rest of the world. Several political and academic circles have considered microfinance to be an important tool to promote economic development and the reduction of poverty. It became a worldwide phenomenon, and the practice disseminated in many developing countries such as Brazil. Even as many authors sing the praises of microfinance—in particular the success in developing countries—the actual experience has fallen short. The goal in this article is to provide a critical analysis of the recent practices of microfinance in Brazil. The article also presents the general characteristics of microcredit in Brazil within the context of the broader development strategy pursued, in particular since stabilization and the inception of neoliberal policies in the mid-1990s. It is argued that microfinance plays an insidious role, making market-friendly solutions for social problems more acceptable. So I have discussed this before. 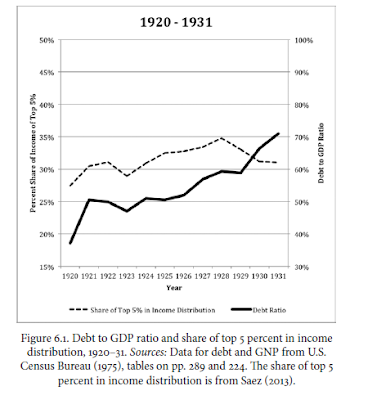 The idea that the Great Depression bears a resemblance to the Great Recession, in that in both cases income inequality increased in the previous period, and went hand in hand with debt accumulation. I cited the Barba and Pivetti paper for the more recent event, and the work by my student Ahmad Borazan on the previous case (see also this post). Now I've been reading Matthew Drennan's book on Income Inequality, and he shows the following figure. In the same vein, he suggests that income inequality was at the heart of the increasing private indebtedness, and at the heart of the Great Depression. Nothing particularly new. An interesting book, worth reading. Rodrik is, or was a few years ago at least, in what Colander, Holt and Rosser refer to as the cutting edge of the profession (my views on that here), which is to say he is heterodox in the same way that Joe Stiglitz or Paul Krugman are heterodox. They are willing to suggest that some imperfections make the laissez-faire dream of the most fundamentalist neoclassical authors somewhat overstated. But as much as Krugman and Stiglitz accept the conventional macro model, with the natural rate hypothesis, the same is true for Rodrik, which essentially accepts the basic Heckscher-Ohlin-Samuelson trade model (for a critique go here). He is a moderate neoclassical economist; a potty trained one if you will, but certainly not heterodox. "Rodrik (1999b) suggested that five types of institutions, defined as behavioral rules that govern the interaction between economic agents, are relevant to explain successful development experiences: property rights, regulatory institutions, institutions for macroeconomic stabilization, institutions for social insurance, and institutions for conflict management." The problem, as I noticed back then, was that the institutions he was pushing for (note that property rights are in the original Williamson consensus decalogue) were more harmful than good. They reduced the ability to promote state intervention in the economy and the scope for industrial policy, they were geared for macro stability narrowly focused on price stability (he probably wouldn't disagree with the idea of the natural rate in macro), and even when he was for social insurance policies, didn't seem to notice that his macro policies would make more social spending almost by definition impossible. I should say that I find it very apropos that Kuttner compares him with Albert Hirschman, and calls the latter one of Rodrik's heroes, even if I think Rodrik is a different kind of trespasser, not interested in interdisciplinarity per se, but in using economics concepts for insights into other social sciences. More like a social science imperialist (for my take on Hirschman's interdisciplinarity go here). Hirschman was a development economists that was against planning, and that thought that there was something relevant about Hayek's Road to Serfdom (a book that says that any intervention by the state ends up in a slippery slope towards fascism*; the same argument Reagan made about Medicare in the 1960s). Hirschman had a serious debate with Currie on the issue of planning, regarding the latter's World Bank mission to Colombia, and was generally seen as friendly critic of the mainstream (see Roger Sandilands views, which are, correctly I would add, very critical of Hirschman). Like Rodrik, Hirschman got hired by Harvard, which is hardly known for hiring controversial lefties that go against the grain, which he only left to the Institute of Advanced Studies because he was a terrible teacher. Also, like with Hirschman's contributions, many heterodox and progressive intellectuals tend to overplay the critical aspects of Rodrik's work. In my view, the problem with the friendly critic, that accepts all of the main tenets of mainstream marginalism, without taking seriously the heterodox critiques of the internal logic of neoclassical economics, is that they end up validating some of this illogical ideas, and the foundation for the neoliberal policies people like Rodrik supposedly abhor. On a slightly different note, and I guess once we are in the topic of who should be considered heterodox and who is a follower of Hirschman, here is another question of labels. Dietrich Vollrath comes out of the closet as a Malthusian. That's a bit funny. I know neoclassical economists, in particular, after Clark's A Farewell to Alms, have come to embrace the epithet, but in all fairness, for a reasonably educated person Malthusian is sort of an insult (btw, on my views on some of the mistakes with the ideas of demographic transitions and Malthusian traps see this). * On this, Jeremy Adelman tells us in his biography of Hirschman that: "when he found a copy of Friedrich von Hayek’s recently published (in London, in March 1944) The Road to Serfdom in a Rome bookstore, a nerve was struck. 'Reading this book is very useful for someone like me who grew up in a ‘collectivist’ climate—it makes you rethink many things and has shown me in how many important points I have moved away from the beliefs I had when I was 18 years old.'" Those would be his more progressive, Marxist, convictions. Hirschman had lived in Germany, not the Soviet Union, by the way. While I tend to agree that macro should deal directly with monetary economies, it's far from clear that the only difference between macro and General Equilibrium (GE) micro is the existence of money. But before I get to that a few things about the AS/AD model in general and Nick's suggestions. Sure money matters, but it's worth remembering that the basic macro principle, the idea of effective demand and the multiplier can be described without directly discussing money. Sure, Keynes noted that effective demand works in a monetary economy of production, and suggested that it was similar to Marx's capitalism (M-C-M') in the drafts of the General Theory (GT). But that was just to note that that the process of production is not about consumption, but about accumulation, something relevant for debunking Say's Law. But the idea that investment (in this case as a proxy for autonomous spending) determines savings, and the adjustment process results from increases in income, does not require a previous discussion of money. So much so that Keynes himself suggests that he only came up with the theory of liquidity preference, and the monetary rate of interest, after the development of the multiplier (and his version the psychological law, and the propensity to consume below one; Kalecki does it by the share of income going to wages below one, and with workers consuming all their income). The worst part of using the AS/AD framework is that most students will mechanically believe in something along those lines, and in particular the notion that the two curves are independent. And even though by the end of the course I try to emphasize that the AS (potential output) can be moved by changes in the AD, along the lines of the Kaldor-Verdoorn, it is harder once they have been using both curves independently. That leaves the issue of the micro/macro relations and Nick's notion that money, which he sees as a medium of exchange in typical neoclassical fashion rather than as a unit of account that represents the power of the State, is the main difference with micro. In my course, the first thing I discuss is the different views of what macroeconomics is, simply the aggregation of individual rational behavior, or as in Keynes' notion of the fallacy of composition something beyond simple aggregation. One example I use is Keynes' notion of financial markets as a beauty contest, that is, the idea that agents in financial markets are concerned with the average view of where the markets should be. So the behavior of one agent affects the behavior of others. But the main problem with the notion of conventional neoclassical micro is more complicated than the lack of interdependence of preferences, or the lack of money for that matter, but the very core notion of the principle of substitution. I only discuss this in my course, briefly when I have to deal with investment behavior and Keynes' acceptance of the marginal efficiency of capital. And yes, that requires some understanding of the capital debates. * I should add that I make the distinction that you could have short run effects of money in the simple neoclassical story, but not in the long run, in which cycles are dominated by technological shocks (phlogiston as Romer would aptly call them). In my view, in the long run the main effect of money would be on the level of the normal rate of interest, and it's impact on income distribution and the dynamics of debt. But those are discussed only cursorily in the undergraduate course. The New York Times had a while ago a whole piece on Chetty, Saez and co-authors about the lack of capital mobility in the US. No surprises really. 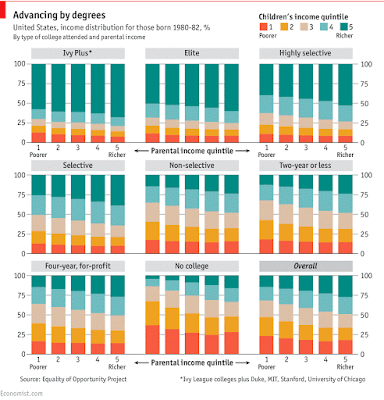 Turns out that universities can increase social mobility. The problem is that universities don't do enough. Bucknell actually has considerably more students from the 1% than from the bottom fifth. 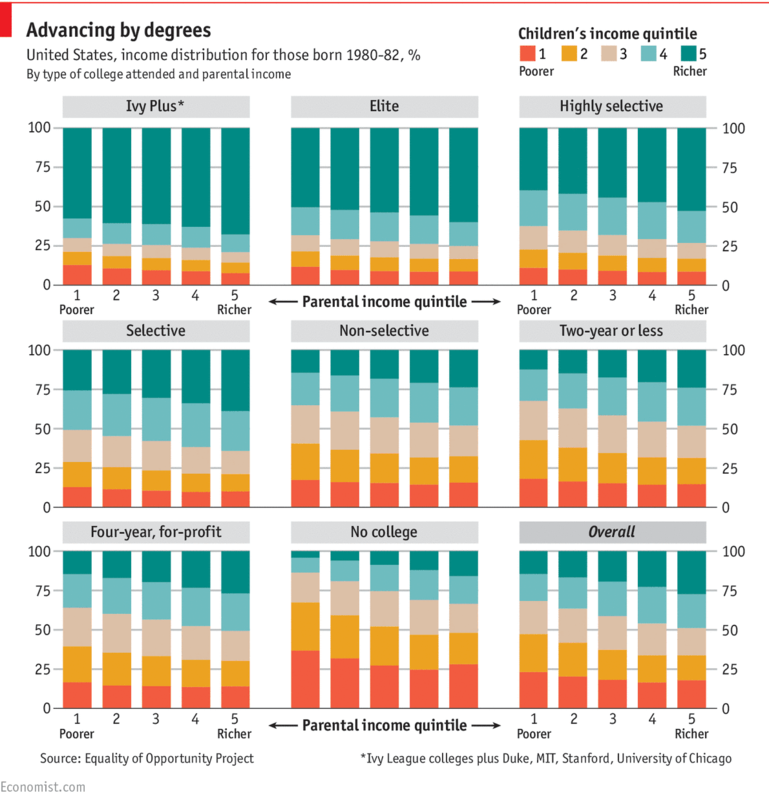 One way to increase social mobility would be to expand the scholarships for low income students. Somehow I doubt that the guy from Trump University would do much on that front.